This series on Cooking for the New Mom focusses on ‘postpartum’ food, pathiya samayal in Tamil, or food for new moms after childbirth. Easy recipes for Cooking for the New Mom, & Daily Meal Plan for each of the first 40 days after delivery, keeping in mind the balance of nutrients needed. This post describes the broad diet plan and the Menu for cooking for the new mom, each day after delivery, with links to some recipes. The recipes follow traditional Indian practices for food after delivery, generally on the Ayurvedic principles. 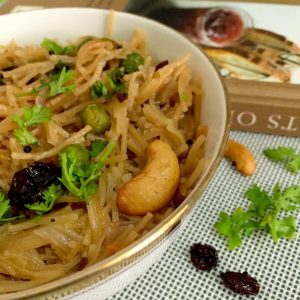 Whether you are North Indian or South Indian or living outside India, you will find the recipes easy to follow and prepare. 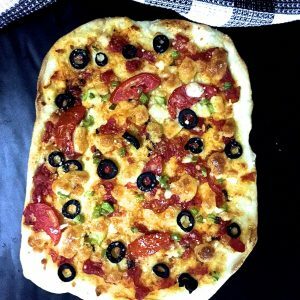 Don’t be surprised to find homemade pastas and pizzas in the menu, they help in varying the diet without doing any harm. More recipes are in the process of being added to the blog. I started this post when my daughter Mridula’s second baby arrived in Jan this year. Once she was back home from the hospital, everything at home was keyed to nurturing the New Mom and the Baby. Natasha, now the Big Sister (and all of 3 3/4 years old) was as usual involved in everything that was happening. Given a chance, she would look after Baby all by herself, but for the time being was allowing her Mom to do so. Nanni’s role was now to ensure the right diet and that tasty nutritious food, just right for the New Mom was on the table at the right time and at the right temperature. Luckily I love cooking and this was for me a golden opportunity to set out recipes for what is almost a new cuisine. The first 40 days are important to set the new mom on the path to health, and I began planning each day’s menu very carefully. This is the 3rd time I was taking care of one of my daughters, post delivery – the first was nearly 5 years ago when I went to Connecticut for Lakshmi’s delivery. Baby Tamma decided to come very early and Nanni was still in India when the call came that the grandchild had arrived, safely. I flew out the next day, grabbing whatever Indian condiments and mixes I could manage to organize in so short a time. Having experienced the benefits of a strict South Indian postpartum diet myself, I was keen to ensure that I would do the same for my daughters. Of course with changing times and tastes, the diet has also to be adjusted, though I have broadly stayed within the traditional framework for such food. 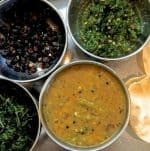 The challenge in cooking for the new Mom, at Connecticut, was getting the vegetables that form part of the South Indian diet for a new Mom. The local ‘India’ store came to my rescue, until I realised that all I need is a diet type and not precisely the same vegetables that we use in India. A year later when Natasha was born, I was in Mumbai to take care of Mridula. Slightly more seasoned now, I was able to turn out tasty food suitable for the Indian post delivery diet. Of course I added my own learnings with Western oriented recipes, to vary the diet so that it was not boring, and fresh flavours hit the palate and made the food interesting. This time I was at Hyderabad where it was easy to source the vegetables I need. There was a store right next door and I walked across every day at mid morning to pick up the veggies and fruits for the next day. Online shopping is also easy and deliveries are quick. Cooking for the New Mom has been easier this time. The link below is to a vendor to whom PepperOnPizza.com is affiliated. If you click and purchase through the link, I will earn a small commission. I only promote brands and products that I trust and use. The food I have planned has variety, and each is by itself easy to make. I will prepare and grind some spice mixes which I can use readily, instead of having to fry and grind them for each recipe. Why do you need a special diet for a New Mom? 1. While cooking for the New mom, it is important to keep in mind that just as the mother and child should be kept protected from chill breezes, cold water etc, it is important to give food that warms the body rather than cools it down. 2. 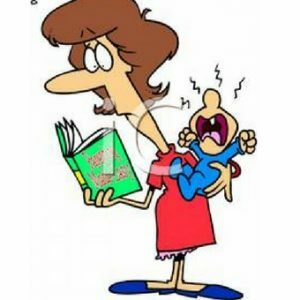 Food for the New Mom should be soothing to the tissues – no chili (whether fresh chili, dry chili or chlli powder) or spices such as clove, cinnamon, anise, cardamom, etc. And no ‘garam masala’ or curry powder. 3. Anything acidic is not good for the body at this stage – so no citrus fruits (lemon, orange etc), nothing sour or acidic like tamarind, sour curds or anything fermented. (idli dough seems an exception to this rule, I am not sure why, as the dough is fermented before use). Tomato is generally avoided as it is acidic, though I started adding a little tamarind or red ripe tomato once in a while, after the 4th day from delivery. It didn’t do any harm, and after 10 days I began to add tomato to dal, rasam, khichidi etc so that Mridula could get some of the benefits of the ripe red tomatoes. 4. Protecting the Baby from Colic or other tummy disorders is very important, so in turn the food for the breastfeeding mother should be easily digestible. Rajma, thowar dhal (pigeon lentils) are therefore out. Chickpeas only when cooked and pureed into hummus or other similar consistency. 5. Salads and anything uncooked are not right when cooking for the New Mom. Starchy vegetables such as potato, or cruciferous vegetables that can cause gas (which can easily give the Baby gas too), such as cauliflower, cabbage and broccoli are to not to be included in the diet. Parsley is not advised. At the end of a month (30 days after birth), I introduced potatoes, sparingly. I made the usual vegetable kootu, adding boiled potatoes to the dhal instead of the green vegetables I generally used. Cauliflower, finely chopped, was added to koottu or sautéed and served with chappaties in the 3rd week. It did not seem to go well with the baby, so we gave it up for a while. 6. Western foods that I found safe to give Mridula from the 3rd week, were home made Pizza and Wheat based Pasta, with homemade delicious tomato sauce. 1. Greens and leafy vegetables (to be cooked and not taken raw)- methi or fenugreek leaves are an important part of the diet. Greens give the essential iron. 2. Garlic – important as it helps in lactation. 6. Ghee (clarified butter) or Butter to be used instead of oil. If Oil is used, it should be sparingly added and sesame and olive oil are advised. Coconut oil is again ‘cold’ though it is used extensively in some homes. 7. Almonds, Walnuts, Raisins, Dates. 8. Fruits – apples, pomegranate, banana, melon – all at room temperature. 9. Soft unprocessed cheese such as ricotta and paneer. 10 Ajwain seeds (caraway/ carom), fenugreek seeds, mustard seeds, cumin seeds, dry ginger, turmeric, curry leaves, coriander leaves. 12. Pink or orange Masoor dal (split red lentils) are easy to digest, highly nutritious, add flavour and said to help in producing more breast milk. Introduced after 10 days from delivery. Whenever I tried a new ingredient in the food while cooking for the new mom, we would watch for at least a day to see if it affected the baby adversely, whether there was frequent or painful gas formation. New foods (vegetables or lentils0 were introduced only at lunch and not at dinner (to avoid gas or stomach upsets at night). 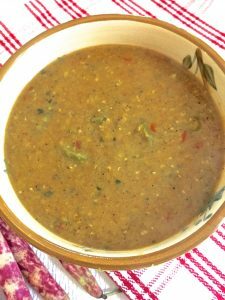 Masoor dal was substituted for moong in the rasam or kootu or made as dal, once every 3 days or so, from 10 days after child birth. After 3 weeks I started adding a little onion to the dal or vegetables once in a while. 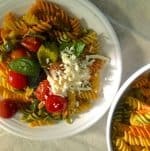 From the 3rd week I introduced an occasional wheat based pasta in a plain tomato basil sauce, with zucchini and peppers, to give a change in taste. 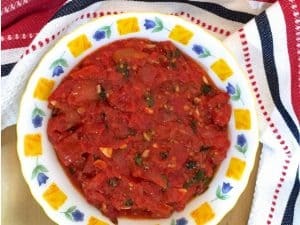 Click on the name for the Link to the recipe for Tomato Basil Sauce. Home made pizza also made its way to the dinner table in the 5th week. Oats porridge or idli for breakfast, and maybe an occasional uppuma or buttered toast. Juice or soup mid morning, with lukewarm water used in the freshly squeezed juice. Lunch South Indian style (at the moment) till we progress to chapatis and dhal subzi or a wheat based quesadilla or pasta. Mid afternoon – some fruit. 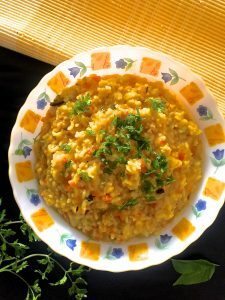 Dinner by 7 pm – khichidi, as it is nutritious, warming and easy to digest. Different vegetables each day to keep a variety. After the first week, chappaties with dal and subzi instead of khichidi, on some days. 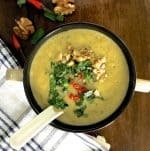 Warm Soup around 9.30 pm – different vegetables and flavours each day or a Banana Milk shake at room temperature. 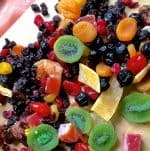 Nuts and raisins or dates as well as fruit, milkshakes, to fill in a gap between meals. Breakfast: Idli – 4 soft warm idli’s with ghee and a light chutney of coriander leaves, peppercorns, curry leaves, salt. Mid day: Carrot and apple soup. Early Dinner – Khichidi – Rice and Moong dhal and sliced marrow (chowchow) pressure cooked with ghee and ground pepper, ginger, garlic, turmeric. Water – sipped during the day, lukewarm (boiled with ajwain/ caraway seeds) – about half a teaspoon of seeds to a litre of water. Add them to the water you set on the stove, and boil them together. Strain and pour into a flask so that the new mother has a flask of water at hand. Encourage her to drink some water before and during breast feeding the baby. Mid day: Carrot and walnut soup and a banana on hand as there is a hospital visit before lunch. 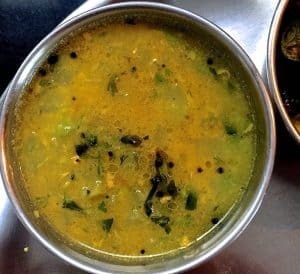 Drumstick Poritha Kuzhambu – a gravy from a paste of black peppercorns, black gram dhal, asafoetida and cumin seeds cooked with split moong dhal and turmeric. Karuvepalai Thogaiyal – a paste from sautéed Curry leaves with fenugreek seeds, peppercorns and asafoetida. Early Dinner – Khichidi – Rice and Moong dhal with vegetables pressure cooked with ghee and ground pepper, ginger, garlic, turmeric. 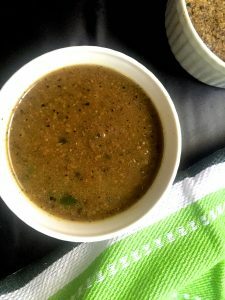 Pepper Jeera Rasam – soup of tamarind extract boiled with garlic, peppercorns, cumin seeds and curry leaves. 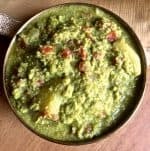 Peerkangai Thogaiyal – a chutney of ground sautéed Ridge gourd peel with peanuts, lentils, fenugreek seeds, peppercorns and asafoetida. Early Dinner – Khichidi – Rice and Moong dhal pressure cooked in ghee and ground pepper, turmeric and cumin seeds. Lemon Rice: Rice mixed with lemon juice tempered with mustard and powdered cumin seeds and peppercorns, and curry leaves and turmeric in ghee. Early Dinner – Khichidi – Rice and Moong dhal and vegetables pressure cooked in ghee and ground pepper, turmeric and cumin seeds. A one pot lunch today: A simple pulav of rice cooked with carrots, capsicum (green) and baby zucchini, with onion seeds, turmeric powder and minced pudina (mint leaves) in ghee, liberally flavoured with fresh ground pepper and cumin seeds. The 7 day Menu for cooking for the New Mom, above, may be rotated or the items mixed and matched for each of the following days in the 40 days period. It is important to keep the balance in nutrition while cooking for the new mom – rice or chappaties, at least 2 different vegetables, a dal or a sambar/ kozhumbu or rasam, for lunch. Khichidi with different vegetables each evening for dinner or Chappaties with vegetables from the menu above instead of khichidi, if rice was taken for lunch. When Cooking for the New Mom, ensure you do not give her raw salads or raw onions or tomatoes, carrots etc. Also ensure the warm water with ajwain or fennel seeds is taken during the day. Lentils should form part of the meal at least once a day. Green leafy vegetables every alternate day. Carrots to be added whenever possible – to the khichidi or the dal or the kootu. Mridula does not care for curd, otherwise curd rice would have been good at least once a day – with hot rice and curd at room temperature. No pickles along with curd rice! Hello Mam, Could you please help me with podi’s which I could prepare now and use it postpartum. I’m in my 8th month now. Hi Saranya. 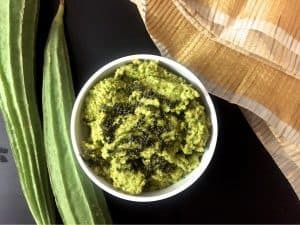 I will email you recipes for some podis that may be prepared in advance. Let me know what else I can do to help you prepare! Mam thank you for such a nice and detailed post. I felt like my mom was explaining it to me, she passed away 6 years back… Miss her too much to describe in words. I’m now blessed with 2 boys and my lil one is gonna be 2 months in a few days. I’m managing all by myself so this post is a great help. 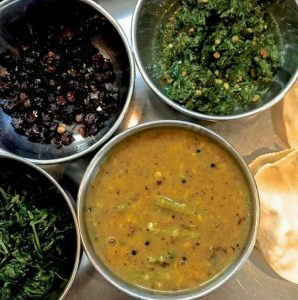 Can you pls share the podis and other things we can keep ready for all kootus/curries… Thanks a ton in advance! Thank you Aishwarya. I’m touched and I can empathize with how you miss your Mom. I started writing these posts when I saw how much my daughters liked the pathiya samayal regime I put them through after delivery. As the recipes for the podis will take a little time to post, I’m sending them to you directly, by email. Please feel free to get in touch with me for any advice or support I can give. All the best to you and your family. Thank you so much for these amazing recipes and very clear instructions. I have 8 more days before delivering my second child via c-section and my hubby and I plan to do this on our own. So your daily menu will be our guide. Can you suggest any prep work (podis ground for poriyal and rasam) we can do ahead of time? Also how do you make oats porridge and rice porridge? Your daughters are truly gifted to have you and you have created this wonderful resource for moms like me who are confused by so many internet recipes. Thanks and my best regards. Thank you Subha for your appreciation. I will send you ‘podi’ Recipes later on today/ tomorrow as well as for porridge/ kanji. All the best and do let me know if there is anything I can do to support your husband and you at this time. Your recipes have variety. I am sure my daughter will love it. And I also love the food plan for each day. Can you tell me how to make banana milkshake? The post is very useful and has variety of different items from the normal ones which is boost for foodies like me :). Can you please share details of food recipes for 10th and 11th day from delivery? Hi Madhumita. I’m glad you found this post useful. I have given the menu for 7 days and after that, the menus can be repeated for the remaining days or else some mix and match can be done, keeping within the framework of the menu. My daughter preferred thin vegetable khichidi for dinner almost every evening during the 40 days. If there is any specific recipe you would like (that I have not given) please let me know. Hi mam, the post is a big relief to the naanis. I am going to take a print of it n keep it ready for my mom who will be coming to US during my delivery this yr.
Btw we have met in a baking class (Jeyadra’a place) in blr. Once again thanks for the handy recipes. Pls keep posting more. Hi Harini! Thank you and I wil be posting recipes for all the various items in Cooking for a New Mom, soon! Feel free to ask if you want any specific recipes. As the key recipient of this wonderful package, on thing is for sure. Lunch is the highlight of my day. Never imagined that my post partum diet could be so full of variety, flavour and sheer yumminess! Between my tamilian Thalis, the khichiris, the pastas and the roti subzi combos, their is really nothing I am missing! Glad that you are enjoying this, in spite of the little glitches that come up! Very well compiled post for a new mom and for the mother of a new mom. Good and useful information, tips, suggestions. Thank you so much, Sundari Giri! Time is the big challenge, I have yet to post the really traditional and lesser known recipes. I’m hoping to post one a day this week. No time for setting up props or even decent photography as its all I can do to reach the food to the table on time!